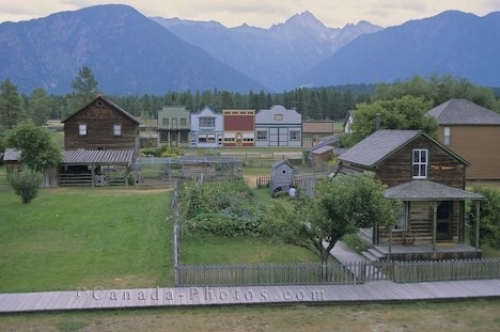 Photo of Fort Steele Heritage Town, founded in 1864 by John Galbraith, Fort Steele, British Columbia, Canada, North America. Fort Steele was a gold rush boom town in the East Kootenay Region of British Columbia. Wood slat walkway runs along the front of the log homes that are set up within picket fenced yards. A row of shops sit in the distance with a breathtaking view of the forest of evergreens and the endless mountain range.